I have sold a property at 5 1235 10TH AVE W in Vancouver. Excellent location for this well-laid-out, top-floor, corner unit home in Fairview. Self-, well-managed building with updated roof, low E energy windows, updated common area. This home shows very well with tasteful updating throughout. Excellent location for Fairview & Granville. Walk to great shopping, restaurants, & transit. Rentals allowed. Could be purchased furnished! I have sold a property at 619 SANDOLLAR PL in Delta. VANCOUVER, B.C. – January 5, 2016 – In a year when the number of homes listed for sale was below historical averages, actual home sales in Metro Vancouver set a new record. Sales of detached, attached and apartment properties in 2015 reached 42,326, a 27.8 percent increase from the 33,116 sales recorded in 2014, and a 48.4 percent increase over the 28,524 residential sales in 2013. The number of residential properties listed for sale on the Multiple Listing Service® (MLS®) in Metro Vancouver in 2015 reached 57,249. This is an increase of 2.1 percent compared to the 56,066 properties listed in 2014 and an increase of 4.6 percent compared to the 54,742 properties listed in 2013. With sales-to-active-listings ratios above 25 percent for 11 months in 2015, the Metro Vancouver market experienced seller’s market conditions for much of the year. The MLS® Home Price Index composite benchmark price for all residential properties in Metro Vancouver ends the year at $760,900. This represents an 18.9 percent increase compared to December 2014. Residential property sales in Greater Vancouver totalled 2,827 in December 2015, an increase of 33.6 percent from the 2,116 sales recorded in December 2014 and a 19.8 percent decline compared to November 2015 when 3,524 home sales occurred. 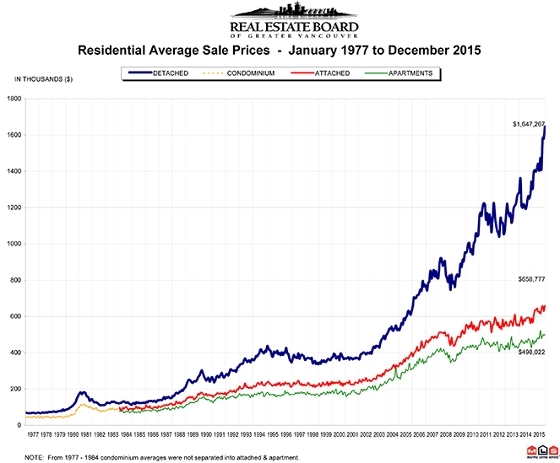 New listings for detached, attached and apartment properties in Greater Vancouver totalled 2,021 in December 2015. This represents a 7 percent increase compared to the 1,888 units listed in December 2014 and a 40.4 percent decline compared to November 2015 when 3,392 properties were listed. The total number of properties currently listed for sale on the MLS® system in Metro Vancouver is 6,024, a 41.6 percent decline compared to December 2014 and a 25.6 percent decrease compared to November 2015. Sales of detached properties in December 2015 reached 1,136, an increase of 36.4 percent from the 833 detached sales recorded in December 2014. The benchmark price for detached properties increased 24.3 percent from December 2014 to $1,248,600. Sales of apartment properties reached 1,225 in December 2015, an increase of 34.3 percent compared to the 912 sales in December 2014.The benchmark price of an apartment property increased 14 percent from December 2014 to $436,200. Attached property sales in December 2015 totalled 466, an increase of 25.6 percent compared to the 371 sales in December 2014. The benchmark price of an attached unit increased 13.6 percent from December 2014 to $543,700. I have sold a property at 515 38 1 AVE W in Vancouver. Pedestrian friendly, pet friendly, people friendly. Live steps from the water and minutes from the city in perfect peace and harmony at The One, in this prime South East False Creek neighbourhood. Here, award-winning Pinnacle International offers you beautifully crafted homes, designed to take in light and views through extensive use of glass. The added bonus of hotel-style amenities make every day feel like a holiday-at-home. Open house December 13th 12:00-3:00PM.